The vintage look of this bag is its main appeal with very good quality soft leather. It’s a classic style with a little twist having plenty of compartments for the usual freelancing kit. The inside compartment for the laptop – in my case a 13″ Macbook Air – is very neat with lots of padding. My usual cover won’t fit in, but it’s not really needed as it feels very safe and secure. It has good solid leather handles which means it can be used as a briefcase and has a nice wide strap with solid brass coloured fittings if you want it as an over the shoulder bag. The Scaramanga Mens Citylander isn’t a huge bag so don’t expect to get lots in*. As a coach and trainer it wouldn’t be a bag I would take to hold lots of paperwork. If you’re still analogue and carry a Filofax you can get the laptop and Filofax in comfortably. 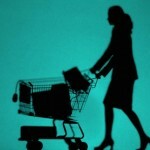 However along with other stuff like charger, computer accessories, wallet, sunglasses and reading glasses the main compartment can fill up quickly. If you’re totally teched up you won’t have to worry as there are cunning compartments for smartphones. There are also two compartments for A4 sized documents or folders and a smaller zipped pocket at the front for a small notebook perhaps. This bag is tiptop in terms of craftsmanship, quality of leather and good strong stitching. The zips are also strong and sturdy – there’s nothing worse than poor quality zips on a bag! The fixings for the strap are well made and engineered. No chance of them coming undone or bending. I expect to get years of use out of this Scaramanga Mens Citylander and it may even outlast me! Absolutely. The strong leather and plenty of padding makes the computer feel snug and secure. The solid leather handles are comfortable and sturdily attached. Being made of leather this might be a bit heavier than some bags but that’s not an issue for me. With the thick adjustable shoulder strap it sits well on the hips and doesn’t dig into my shoulder like some thin straps. It also has a padded shoulder piece with a suede inner lining which also makes it comfortable to wear. Previously I’ve steered clear of over the shoulder bags with handles but as this is neatly designed that’s not bothered me as much as I thought it would. £150. You get what you pay for. Good quality workmanship, stylish and comfortable, excellent quality materials used and can only improve with age as it gets more distressed. Freelancers on a day out for meetings, Jelly or co-working. The Scaramanga Men Citylander is sold as a man bag but as it’s not over-large it could also appeal to women. *Scaramanga are developing a more spacious Citylander for those who want to carry more. 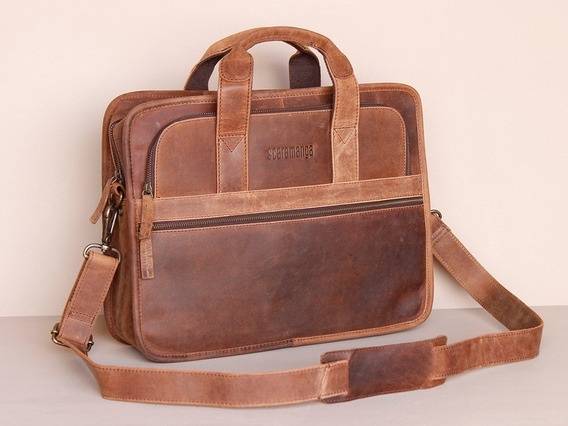 Thank you to Scaramanga for supplying us with a Scaramanga mens Citylander leather laptop briefcase for our laptop bag reviews. Buy your own Scaramanga mens Citylander leather laptop briefcase.